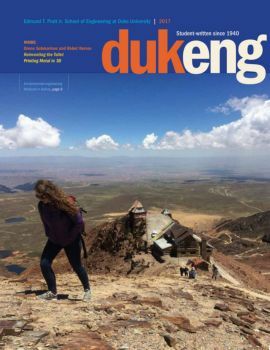 The DukEngineer magazine is an undergraduate engineering student tradition dating back to the 1940s. Each year, a volunteer team of student editors and writers prepare a magazine that chronicles their experiences and perspectives. Students write about engineering club activities, study abroad, their research, opinions and Duke campus life. An alumni updates section is also included to help the Duke Engineering community stay in touch.